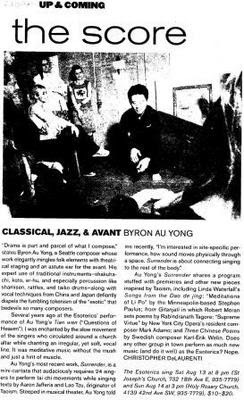 “Byron Au Yong, a Seattle composer whose work elegantly mingles folk elements with theatrical staging and an astute ear for the avant... defiantly dispels the fumbling tokenism of the ‘exotic’ that bedevils so many composers. Several years ago at the Esoterics’ performance of Au Yong’s Tian Wen, I was enchanted by the slow movement of the singers who circulated around a church altar while chanting an irregular, yet soft, vocal line. It was meditative music without the mush and just a hint of muscle."